Hit F1, check the "Launch in fullscreen" box and re-launch the game. 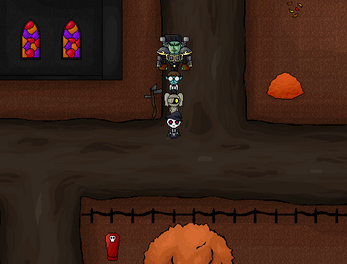 HorrorVale Demo 0.2.0 + Patreon! I just played through the demo, and I love it! The world building and humor are absolutely fantastic! My one complaint would be maybe tell the player about running earlier? Other than that, I have no complaints! In regards to an MV port, it's not something we're looking into at the moment. VX Ace is doing the job for what we want to accomplish. Thanks for your interest though! I've completed the entire series in 5 parts, and I am fairly , certain that I've explored and found everything. If you get stuck on getting out of the mansion check part 1. If you get stuck on finding the location of the generators, check part 4. If you get stuck on the music part of the Forgotten Mansion and just want to know how to get the medallion, watch part 5. More generally, part 5 has the wraps questline, and a walkthrough of the forgotten mansion. Hey, I'm really looking forward to this game's release. I also jumped on board for the Monster Design contest and I have high hopes for it. Quick question, though: do you guys have any plans to release this game for all computer platforms, or is it going to be a Windows exclusive release? Cuz I'd really like to play the game but am limited to a Mac at this time. We'd love to be able to get it on Mac but we're working with VX Ace so it's not entirely straightforward. If we figure something out though we'll definitely look into getting out a Mac version of Demo No.2! Have you tried running it in a program like WineBottler? Did you make this in RPG Maker VX Ace? I also wouldn't mind it being the demo only. Cause the game isn't finished yet I take it? Also was I right about Nitrorad or what? This was a really fun demo, but how long is the demo in total? I just got out of the house btw. I want to complete the demo, and I just want to know how many episodes I am committing to. can I help ? I love this game! do you have discord or twitter? We do have a Discord!!! I really like the art style and the music is great. I'm looking forward to the full release. I loved the demo of this and am looking forward to this getting updates in the future! Humour is great, the combat is great, art is great and overall it was just a really fun experience. While they may exist somewhere, I personally didn't run into any issues or glitches while playing so nothing to report on that end.